Forums › Spark New Zealand › Spark Performance? I was recently contacted by Spark and offered a plan which undercuts my current ISP (Orcon). So I'm here to gather some opinions! They're offering $99/month for VDSL unlimited traffic, with a 12 months contract. 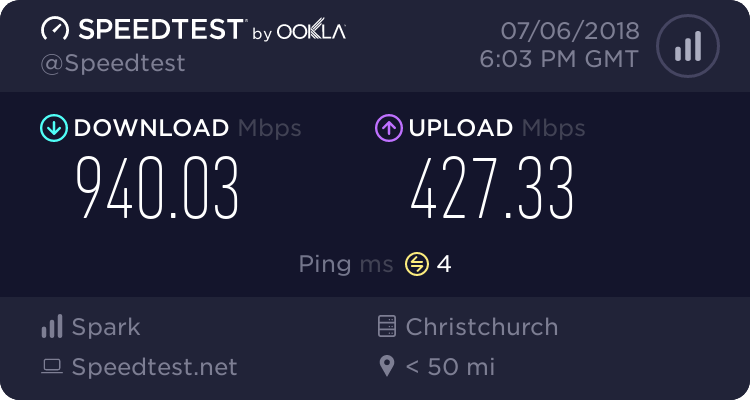 Since I'm already on VDSL, I'm assuming I shouldn't be seeing any performance differences in the physical connection? I'm getting around 49Mbps right now. I've looked through TrueNet's charts here and both Spark trails Orcon ever so slightly in every category. Existing Spark customers, what are the things you like or don't like about Spark? Does speed degrades to an unbearable crawl during peak hours? Would you recommend Spark to others? truenet isnt a real performance indicator since each area is different but in my experience peak time performance is fine. For reference, I have a Spark 100Mbps fibre connection at home, and previously had VDSL2 and ADSL2+ with them, for over 5 years now. I am in a fairly good location for broadband (less than 250m cable length from cabinet, got ~60/10 on VDSL for example), which may bias me towards better performance and less issues I suppose, regardless of ISP. I use Spark VDSL, no issues here. You will be connecting to the same cabinet so no sync speed differences. Could always try BigPipe if you don't need all the frills. Sub brand of Spark and slightly cheaper still with no contracts. insane: Could always try BigPipe if you don't need all the frills. Sub brand of Spark and slightly cheaper still with no contracts. I know I'm going to be accused of being biased, but even if I wasn't a Spark employee (RED FLAG - I AM - AND THEREFORE BIASED!) I'd use Spark for my Broadband.